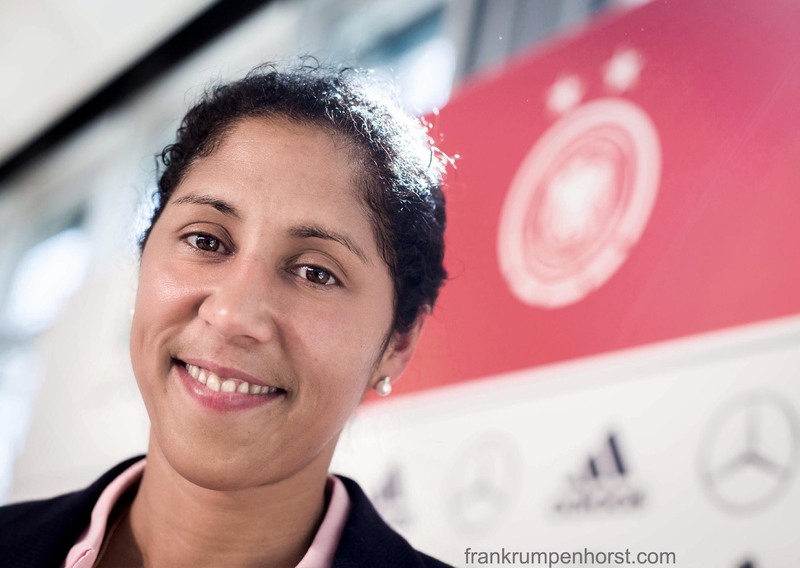 Steffi Jones, the designated new coach of Germany’s national women soccer team, pictured following a press conference at the headquarters of the German soccer federation DFB in Frankfurt, Mar. 30..
Mirianne Uffenbrink holds a makeshift gallows with a hanged stork during a protest by widwives and many mothers and families on International Women’s Day in Frankfurt, March 8. Midwives, still being a regular feature of childbirth in Germany, are facing unacceptably high liability insurance premiums and low wages. Many were already driven out of the baby-delivering business. Two rowers on Main river at daybreak in Frankfurt, Jan.28. There are quite a lot of rowing and canoeing clubs along the river. A scene from the FIFA Women’s Worldcup 2015 soccer qualifying match Germany vs Croatia in Frankfurt, Oct. 30, showing Croatia’s goalie Doris Bacic (left) and German players Alexandra Popp (center) and Annike Krahn (right). Germany won 4-0.